Volunteers are needed at the Grace Good Shepherd Church Pantry Garden. The garden has workdays every Saturday morning at 10 a.m. It is located at 1450 Hiller Road in McKinleyville, behind the Grace Good Shepherd Church. For more information please contact Debbie at (707) 269-2071. The community garden at Jefferson Community Center, located at 1000 B Street in Eureka, has workdays every Saturday from 10 a.m. to 12 p.m. Produce goes to the after school SEEDS program and the Fresh Produce Stand on Saturdays at 10 a.m. For more information please call (707) 497-6280. If you are looking for space to garden this season, there are community gardens with room for more participants. Contact information for many local gardens is available on the Local Garden page of www.northcoastgardens.org, or please call the North Coast Community Garden Collaborative at (707) 269-2071. While many local farmers' markets started the season in May, many more are opening up in June. You can use your CalFresh EBT card at any of these locations and receive a dollar for dollar match of up to $10 through the Market Match program, once per market! Visit the info booth at any of the farmers' markets listed below to learn more about using CalFresh and Market Match or to find out of you are eligible to receive benefits for the CalFresh program. Old Town, Eureka: Opening for the season on June 7th, 2016. Every Tuesday from 10 a.m. to 1 p.m. on F Street between 1st and 2nd Street. Wildberries Marketplace, Arcata: Opening for the season on July 5th, 2016. Every Tuesday from 3:30 to 6:30 p.m. At the corner of G Street and 13rd Street. Fortuna Farmers' Market: Every Tuesday from 3:00 to 6:00 p.m. at 10th and Main Streets in downtown Fortuna. Henderson Center, Eureka: Opening for the season on June 9th, 2016. Every Thursday from 10 a.m. to 1 p.m. Located where Henderson Street meets F Street in Eureka. Eureka Natural Foods, McKinleyville: New for 2016, at the new Eureka Natural Foods store located in the old Ace Hardware site on Central Avenue and Pickett Rd. The new ENF store is still in construction but the farmers' market will take place even if the store has construction delays. Every Thursday from 3:30 to 6:30 p.m.
Garberville Farmers' Market: Every Friday from 11 a.m. to 3 p.m. at Locust and Church Streets. Arcata Plaza: Every Saturday from 9 a.m. to 2 p.m. at 8th and G Streets. 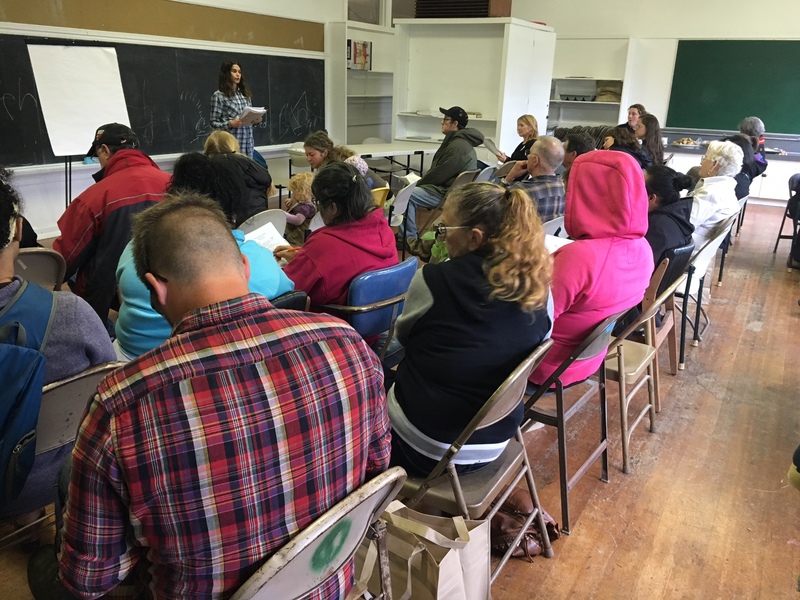 Around 50 people came to a Community Garden Workshop on Saturday May 21, hosted by North Coast Community Garden Collaborative. 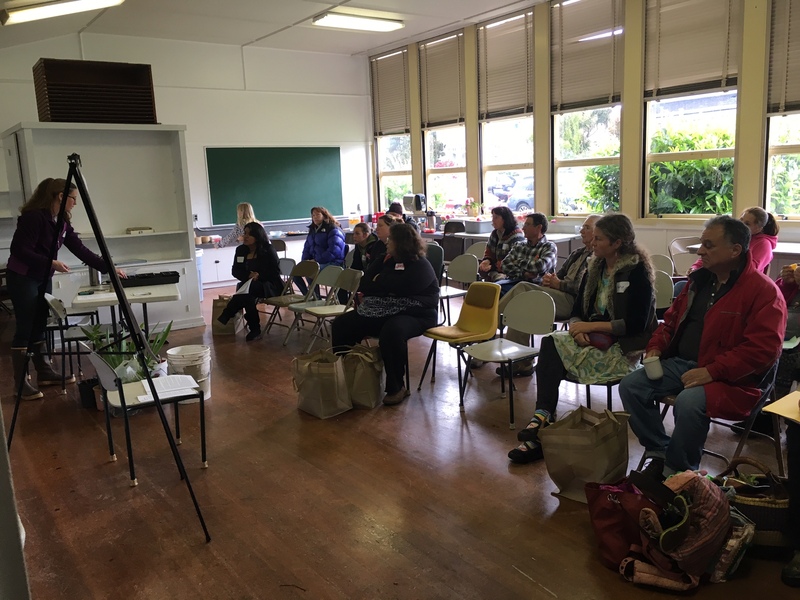 The workshop, held at Jefferson Community Center in Eureka, drew people of all ages from as far away as Crescent City, Klamath, and Willow Creek. Local experts shared skills and resources for residents to grow thriving community gardens. Topics included outreach strategies, pest control, creating inclusive spaces, donation solicitation, plant propagation and seed starting, school gardens, garden design, and more. The North Coast Community Garden Collaborative (NCCGC) would like to thank the many people who helped make this event a success: Pamela Goodwin, Fortuna Community Garden Coordinator; Stan Schmidt, Grace Good Shepherd Church Pantry Garden Coordinator; Steve Palecki, Fortuna Community Garden Project Coordinator; Bernadette Clueit, Humboldt County Master Gardener; Sue Moore, Jacoby Creek School Garden; Edie Jessup, Locally Delicious; Argie Munoz, Garden and Food Resource Assistant for Open Door Community Health Center; Emily Sinkhorn, NCCGC Steering Committee member; Fred Krissman, NCCGC Steering Committee member, Deborah Giraud, NCCGC Steering Committee member, Tom Schrader, Humboldt County Master Gardener; and Michael Kein and Caterina Lewis-Perry, Fresh Roots Humboldt. Residents share skills for community gardens to grow and thrive at North Coast Community Garden Collaborative's "Community Garden Workshop" last month. - Rainwater and Greywater Recharge: Tuesday, June 7 from 5:30 to 6:30 p.m. at Freshwater County Park on Freshwater road. The Humboldt Permaculture Guild invites the community to visit a local homestead in Freshwater to see what integrated rainwater and greywater design looks like. The event takes place at a private residence and space and parking is limited. Please RSVP at fogwoodworking @gmail.com or 407-0550. - Old Town Eureka Farmer's Market: Every Tuesday from 10 a.m. to 1 p.m. on F street between 1st and 2nd street. - Fortuna Farmer's Market: Every Tuesday from 3 to 6 p.m. at 10th and Main streets in downtown Fortuna. - Farmers' Market at Eureka Natural Foods, McKinleyville (New location! ): Every Thursday from 3:30 to 6:30 p.m. Located at the new Eureka Natural Foods store at the old Ace Hardware site on Central Avenue and Pickett Rd. - Garberville Farmer's Market: Every Friday from 11 a.m. to 3 p.m. Located at Locust and Church streets. Food for People is experiencing a shortage of fresh food like fruits and vegetables to distribute to clients throughout the County. If you have garden space, please consider planting extra food for those in need. Remember to bring excess harvest to a food pantry near you - Food for People has satellite pantry sites across the County, and locations are available at www.foodforpeople.org or (707) 445-3166. Do you have a fruit tree to share? GleanHumboldt.org is a new website for Food for People's gleaning program, which rescues food that would otherwise be thrown away such as from local farms or residents. If you have a fruit tree with an excess of fruit, you can register with the gleaning program to have insured volunteers come out and harvest it for those in need. For more information please visit gleanhumboldt.org or call Laura at (707) 445-3166 ext 312. 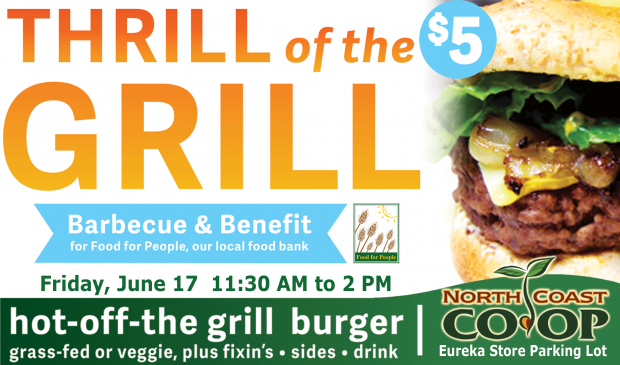 The North Coast Co-op is once again hosting the Thrill of the Grill Barbecue Benefit for Food for People on Friday, June 17 from 11:30 a.m. to 2:00 p.m. at the North Coast Co-op, Eureka Store. Each year the North Coast Co-op generously donates and prepares all food items with the help of donations from their vendors including Humboldt Grassfed Beef, Tofu Shop, Earl’s Organic Produce and more. Bring your appetite and your friends to this year’s Thrill of the Grill and enjoy great food, music and company while helping to protect one of the greatest resources, our children. The cost of lunch is only $5 and includes choice of Humboldt Grassfed Beef hamburger or Tofu Shop tofu burger plus organic green salad, chips and choice of drink. All proceeds from this event will support Food for People’s Child Nutrition Programs, which include Backpacks for Kids, Children’s Summer Lunch Program and the After School Snack Program, working to ensure that every child, every day, has enough to eat in Humboldt County.